Stock status is current as of 4/25/2019 8:32 PMET. Get the job done with powerful Lenovo ThinkPad P72 20MB Laptop PC with its cutting-edge processor, the 8th Gen Intel Core i7-8750H 2.2GHz. It includes a 16GB memory capacity and a 512GB Solid State Drive. With Windows 10 Pro software you can empower yourself and your business to do great things securely across many devices anywhere - with anyone, any time. Easy to use, it helps you can get more done right from the start. It offers you multi-port flexibility, consisting of USB ports, Mini DisplayPort and an HDMI port. For the ultimate in on-the-go productivity, the NVIDIA Quadro P600 is designed to take your visual computing to new heights from complex simulations and deep learning to visual effects and exploring the new worlds of virtual reality. 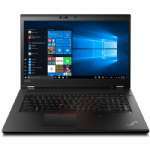 Plus, it comes in 17.3" size IPS Full HD Display with 1920x1080 resolution Purchase the Lenovo ThinkPad P72 20MB Laptop PC today!